There are many choices when making the decision to include a fireplace in your home – wood, gas or ethanol fireplace. And there are many reasons people desire a fireplace for their home. Just think Romance, Comfort, and Community… mankind has been enthralled with fire since the beginning of time. The advent of the Fireplace permitting us to bring fire into the home has allowed man to enjoy heat, light, and hot food going back to cave men. Now fast forward to current times, and while we still require heat, light and food – more modern technologies provide these requirements efficiently and conveniently. However the concept of a fireplace and our connection to fire remains. Fire continues as a symbol of community and of romance. Sitting around the fireplace with friends, family or neighbors with a glass of your favorite wine, port or scotch is a picture synonymous with success. Laying on a sheepskin rug next to your fireplace with the one you love is synonymous of romance. So while a fireplace is no longer a necessity within the home. It remains a highly desired amenity for many homeowners. For them the choice is less “fire or no fire?”, but rather what type of fire. And that decision boils down to either wood, gas or ethanol fireplaces. Wood was the natural progression from primitive camp fires to a fireplace hearth within the home. It still carries with it the primordial connection to fire man first experienced. The smell, sound and warmth of a wood fire are its greatest benefits. The smell of a burning log is something ingrained in our very nature as a pleasant and comforting odor (as long as that burning wood is not the studs that make up our home). Just listen to a soundtrack of the crackle and pop of a fire and your brain immediately create a vision of fire in your mind – we all have that image stored away. And whether its at a ski lodge on the slopes of Colorado, or your living room on a cold winter’s night at home – who wouldn’t want to curl up with a book, or a lover, in front of a warm, crackling wood fire. Not only that, but the exhaust from a wood fire doesn’t burn clean. Wood fireplaces are becoming more regulated. California and now other communities have restricted wood fireplaces, some communities have even outright banned them. Not to mention that cutting, storing, and handling wood for the fire is a hassle. And what about those ‘creepy crawlys’ that tend to live in the wood pile. Frankly, no thanks… I’m pretty happy with the modernization of my home which frees me from the need to have an open wood fire in my home. Alot of cost, and planning go into building a fireplace. You have to have properly designed Chimney, a strong foundation to support it, a clean out, and many other expensive and intrusive elements. Gas was the next natural choice for a fireplace. Its convenient, easy to turn on and light. Which can be made even more convenient with electronic starters that can turn on your fireplace with the flip of a switch, or push of a button. Gas is not a costly fuel to burn in a fireplace and if you have a gas line to your home, its already there in ample supply. So nothing to transport or carry into your home. But alas, despite how hard we try to make a gas fire look natural by adding ceramic or cast steel “logs” or decorative colored glass and stone. It never gets close to the beauty of the flames coming from a natural wood fire. And the exhaust produces high levels of CO and other toxic fumes requiring the fireplace to be vented to the outside loosing alot of its heat value (much like a wood fireplace). Ok, what choice is left? Ethanol fireplace are a relatively new introduction and therefore most are fairly modern in appearance. Ethanol produces a lively natural looking flame. Much more beautiful than a gas flame, which is kind of like staring at your gas range. 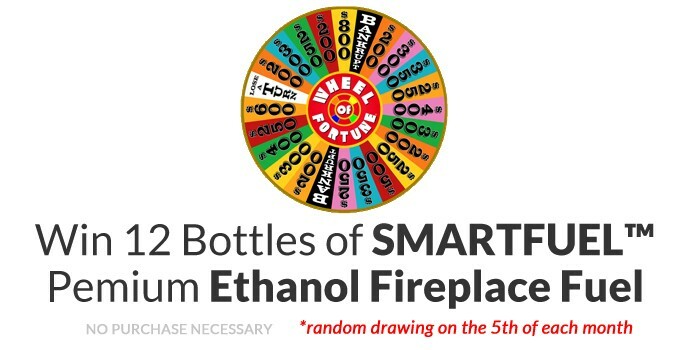 Due to the nature of Ethanol, if you’re burning a high quality ethanol fireplace fuel such as SMARTFUEL™ – there is no toxic exhaust so you can burn these indoors without ventilation. Ethanol when burned in a complete combustion produces only CO2 and Water Vapor. Being ventless saves thousands in installation cost and makes an ethanol fireplace versatile. Easy to install anywhere. In fact, many are quite portable. So now an apartment dweller can even enjoy a fireplace in their home. 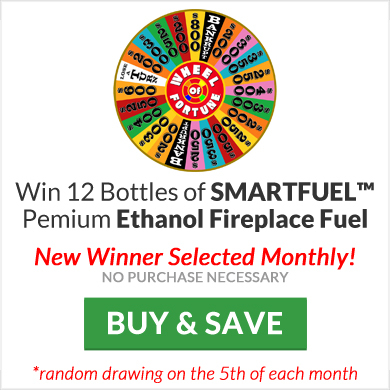 Quality, clean burning ethanol fireplace fuel such as SMARTFUEL™ is readily available online and becoming more affordable every day. Its comes in easy to handle quart or liter bottles for easy transport and storage. 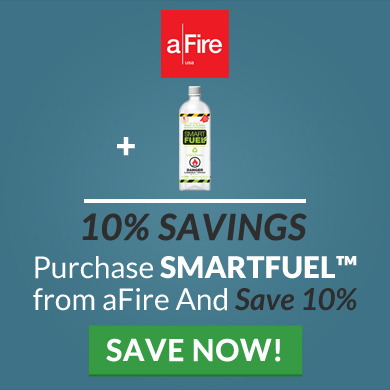 And with a brand like SMARTFUEL™ which has a flame arrestor in the bottle opening to prevent a flash explosion – its safer when refueling your fireplace. Up until now, most ethanol burners on the market were manual ethanol burners – basically a simple metal box that held the fuel, with a slot at the top for the flames to emit. You filled the box and lit the vapors by hand – sometimes unsettling as the fumes will light with a loud “pop” and a possible flash of flame. As the fire burns consuming the ethanol fuel, the flame sunk lower in the box until it was barely visible and finally extinguished. This caused the fire box to get exceedingly hot requiring more clearance, proper insulation, and a more complicated installation. And as it’s simply a metal box with no electronics – there can be no additional safety features such as monitors or sensors that ensure safe and proper operation of the manual ethanol fireplace. aFire has taken the idea of an Ethanol Burner or Ethanol fireplace to new heights. By adding an electronic computer “brain” to the fireplace its creates an entirely different experience. First and foremost it adds superior safety monitoring to all aspects of the fireplace operation (fuel levels, spills, temperature, CO2 buildup, seismic motion, etc, etc, etc…). Next it assures a complete combustion of the fuel assuring an absolutely clean burn with no carbon dioxide or toxic exhaust. An aFire ethanol burner has a seperate and sealed tank for safety. Its electronic fuel pump delivers just the proper amount of ethanol into a combustion tray at the top of the burner. The flame stays at the very top of the burner, receiving proper amount of oxygen, and keeping the burner cool to the touch. This allows closer tolerances, less insulation and a simpler and less expensive installation. Not to mention, visible and more beautiful! Lastly, the electronics in an aFire Remote controlled ethanol fireplaces allow us to operate the ethanol fireplace thru the use of a simple to use, one button remote control. And we include a port that allows you to easily integrate the ethanol fireplace to your home automation system. SHOP AFIRE REMOTE CONTROL FIREPLACES NOW! Grow Your Blog Traffic by 200% with Our FREE Tool!